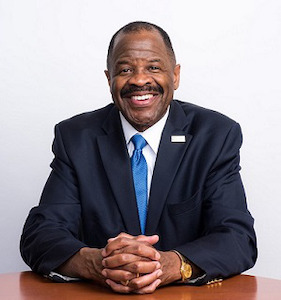 As he discusses experiences in his life that contributed to his success as a legal scholar and dean of the George Washington University Law School, Blake D. Morant doesn’t mention receiving awards and degrees, or even being appointed to two distinguished deanships. Instead, he immediately recalls his years as an Eagle Scout and his upbringing by a mother who encouraged him to develop all of his talents to take advantage of opportunities for advancement. Morant served as dean of the Wake Forest University School of Law for seven years before becoming dean of GW Law in 2014. Morant, whose full title is Dean and the Robert Kramer Research Professor of Law, is himself a symbol of leadership diversity as the first African-American to hold the position. Morant has published scholarly literature in areas including contract theory, media law and administrative law. He also has served as president of the Association of American Law Schools (AALS). He notes that such exchanges are not uncommon these days, “at a time in time in this country when we have so many fissures,” but he also says the uncivil discussions tend to attract more media attention. “The problem…is we haven’t had a very good conversation about how to engage each other when we do have those divisions,” he says. It is the kind of experiential learning that he witnessed in his youth. That influence led to his becoming an Eagle Scout and being selected at age 14 to represent Virginia at a World Jamboree in Idaho, which exposed him to even broader opportunities. He also says his involvement in ROTC was a part of that wide-ranging education because it provided a scholarship that paid for his undergraduate studies and let to his military appointments. Morant says several colleagues and friends have been crucial to his success, including the late Maya Angelou at Wake Forest, where she was a humanities professor, and Robert Scott, professor of law at Columbia University. As dean of two of the nation’s top law schools, Morant has acquired a wealth of experience in academic administration. In 2009, during his deanship at Wake Forest Law, Morant wrote “Reflections of a Novice: Four Tenets for a New Dean” in the University of Toledo Law Review. “In my view, a successful dean possesses a keen sense of self,” he wrote. “In other words, effective deaning requires acute self-awareness.” He further suggested that deans should be “continually reflective” and appreciate the personal strengths and weaknesses that they bring to the job.